In my wine travels, and my writing, I tend to focus on smaller, up and coming wineries, rather than the larger, more well-known ones. I also focus A LOT [maybe too much?] on Paso Robles. That’s why, when I came across these two books, they did not just get dumped into my ever growing pile of books-to-be-read-when-I-have-time. I realize this article is probably too late for your Christmas shopping, but these books would make great use of any Amazon gift cards you got, or even your hard-earned cash. Jon Bonné is the Wine Editor for the San Francisco Chronicle. In this book, he has put together his analysis of what can be considered the cutting of edge of what is going on in California. Lots of winemakers and wineries I was already familiar with, but many others I now need to seek out. This would be a great guide if you’re ready to branch out from the familiar names and really get your feet [and palate] wet. 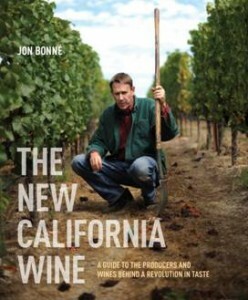 Chris Kassel of www.Intoxreport.com recently spent a month in Paso Robles, digging far deeper than I have ever done. He cautions the reader that the book is not an in depth guide to the region, but is rather a chronicling of his own experience there. So, what is the book about? Well, in large part, it is about winemaker Stillman Brown, who Chris apparently spent most of his time with and who I have written about a few times myself, most recently just a couple of articles ago. Of course, Chris visits with and writes about a few other wineries and winemakers, such as Eberle, Tablas Creek, Epoch, Tobin James, Tablas Creek and Gill. But, even more importantly, Chris does a great job in capturing the spirit of the area, which you can do yourself if you are willing to cut down on the number of tasting room visits and spend more time getting the know the people involved. Michael Perlis has been pursuing his passion for wine for more than 25 years. He has had the good fortune of having numerous mentors to show him the way, as well as a wonderful wife who encourages him and shares his interest. After a couple of decades of learning about wine, attending events, visiting wineries and vineyards, and tasting as much wine as he possibly could, he had the amazing luck to meet Eve Bushman. Now, as Contributing Editor for Eve’s Wine 101, he does his best to bring as much information as possible about wine to Eve’s Wine 101 faithful readers. (2013 Update: Eve and Michael announced Eve Wine 101 Consulting. Info is here: http://evewine101.com/press-releases/) Michael can be contacted at michaelthezinfan@aol.com.